MANILA, Philippines - Militant workers staged a series of picket-demonstrations at headquarters of top corporations that are alleged rabid violators of workers’ right to security of tenure. The protest action led by the Bukluran ng Manggagawang Pilipino (BMP), Union Presidents Against Contractualization and Solidarity of Workers Against Contractualization,targeted the head offices of Philippine Airlines and SM Retail Inc., in Pasay City before proceeding to Ortigas Center, a corporate hub where the head offices of San Miguel corporation, Jollibee Foods corporation, Gokongwei-owned JG Summit and power utility Meralco are located. The militants claimed that the protest was their own version of Oplan Tok Hang of the National Police in its anti-illegal drugs campaign. According to BMP President, Leody de Guzman, “We opted to launch our own Tok Hang in order to assist the Duterte government in identifying the most rabid violators of labor rights and pinpoint those who have intentionally disregarded his call to end the practice of contractualization”. 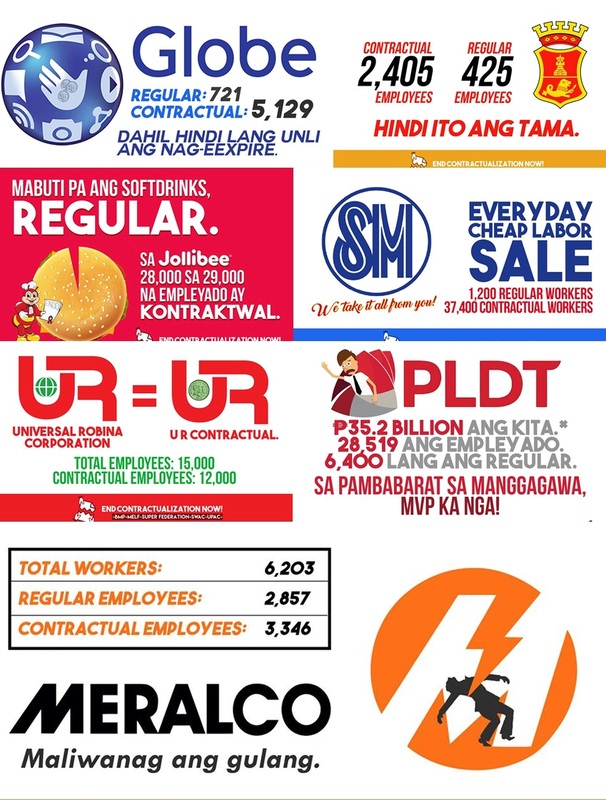 “These shameless capitalists have year after year posted billions of pesos in revenue by violating every letter of the constitutionally guaranteed rights of workers and still have the gall to declare that they are abiding by the Labor Code”, Leody de Guzman, added. Referring to retail giant, SM of Henry Sy, De Guzman cited Securities and Exchange Commission documents submitted by SM last year indicating that its assets totalled to 771.1 billion pesos extracted from its 94,516 employees, of which its parent company can only account for 355 regular employees. Also notorious for busting its labor union, the Philippine Airlines two decades ago had more than 12,000-strong employees including its pilots, ground crew and flight stewards. Today, a little more than six hundred are regular employees and about eight thousand are contractual employees through various “service providers”. 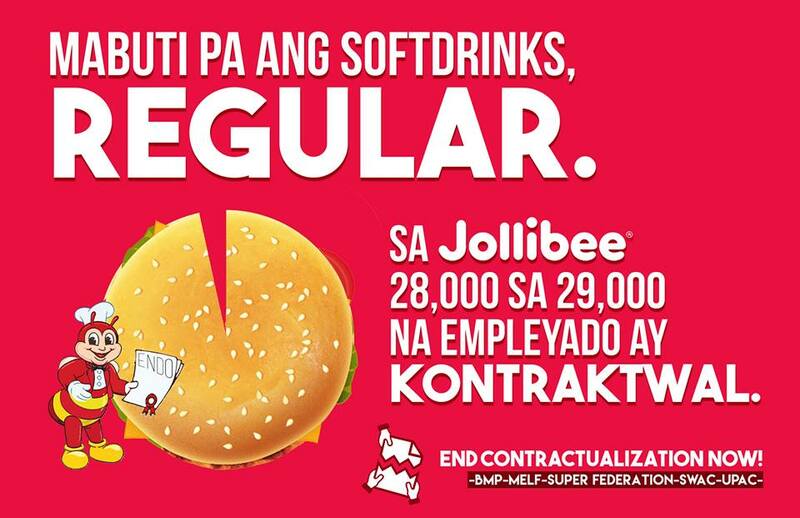 Food giant Jollibee has more than thirteen thousand employees and yet only about three thousand mostly branch managers are considered regular employees. “The large profits of Messrs Sy, Tan and Caktiong do not signify that they are business whiz kids but only dreadful employers, willing to bend our laws to benefit themselves. These spineless capitalists are the primary culprits why almost one-third of Filipinos are living below poverty line,” de Guzman asserted. The militants warned that their protest action is just the beginning of their “war against contractualization” and more companies shall be targeted in the days to come. As of press time, shamed companies by militants workers are yet to release their statement to counter the allegations. The Summit Express welcomes the sides of companies involved in this matter.